"No credit, no problem" I'm sure you've heard this on the radio or on T.V. advertising something that's too good to be true. How about "no down payment required"? Yep, I'm sure you've heard that one as well. I'm sure you know all too well these claims are usually either a flat out lie or they come with some kind of catch. It's really no different in the housing market. The simple truth is that you cannot outright purchase a home without having average to good credit. Bad credit simply won't work. But don't worry, there is a way to get into the home you want without having to apply for a mortgage right away. Rent-to-own homes are the ideal choice for people with bad credit to get into the home they want to buy. A rent-to-own lease agreement lets you move into your home and rent it for a few years as a lease. During the lease period you'd save up money and build your credit score. After the lease period is up you'd buy the home. 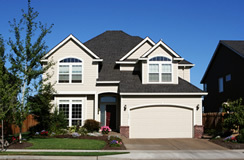 There are several finer points of a rent-to-own agreement you should know about before searching for a rent-to-own home. Your down payment can be mitigated if you negotiate the contract terms. The option fee and rent premium can both be applied towards a down payment on the home after the lease period. The purchase price is also something that can be negotiated. You'll want to lock in the purchase price at the time you sign the lease. The option fee is typically paid to lock in that price and it helps reduce your down payment. Rent and rent premiums are just like paying rent on an apartment with a slight difference. The rent premium portion is applied to down payments. Rent is money paid to the seller to make the mortgage payment and as a safeguard against a leasee that may not be able to purchase the home when the lease period ends. Now that you've learned that a rent-to-own home is a viable option for those with poor credit. Take a look at the rent-to-own real estate listings on our site.